I have been reading about the secrets of a happy life after work, and I must admit than none of them say, “I should have worked harder, should have increased my list of accomplishments or should have won more arguments.” They say “be yourself”. Focus on making life better for you and those around you; build great friendships and love more. Oh well, keeping these in mind, and as I look around me, I see more than ever that the world is obsessed about the need for exceptional performance, particularly in times of unprecedented instability, with perceived reduced resources and worldwide competitiveness at an all-time high. Our organization is no different—our way forward is all about exceptional high performance. But, as we go forward, keep my first few sentences in mind. So where do you go from here? My brain’s decided that there are two dimensions that drive exceptional performance. The first is personal performance. To be the best we can be, each of us needs to plan, develop and perform at higher levels of excellence. A good example of this is Olympians, who work obsessively to sharpen their talent and achieve their goals. How do they do it? They focus on the goal. They continuously improve their skills and sharpen their competencies. They don’t settle for less. They are never distracted by the environment they find themselves in, regardless of how adverse it is to achieving their goal. They turn the negatives into positives and take advantage of the conditions they are in and harness them to work for them instead of being victims. Think of these incredible Kenyan runners who run in life-crushing temperatures and use their environment to develop the stamina that fuels high performance and produces world-class runners, year in and year out. The integrity of your performance should never be negatively impacted by the environment in which you find yourself, however dark it seems or is. On the contrary, like a candle in the dark, its performance is increased as the darkness deepens. The other dimension that drives exceptional performance is the capacity to work in a team. 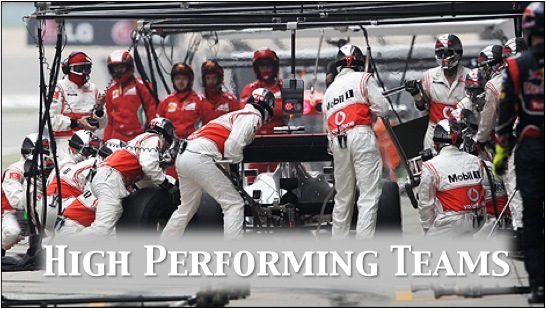 All great performances come from teams! No one human being, however talented, brilliant or deluded enough to think they can go it alone, will ever succeed in the long term if they don’t understand teamwork. It’s the power of a team that makes it happen. As a service organization, it’s even more critical to work in teams because we need to master working with each other and with partners, both in the private and public sectors. People who like to work alone, irrespective of how skilled, will never be as efficient as those who know how to work with others. People who think they know better than the team remind me of the solider who is out of step with his fellow marching soldiers and believes that they are all out of step, not him. I believe that behind every great business success story there is a great team and behind every great failure there is an individual who thought he could go it alone! Exceptional high performers harmonize their personal performance with those other performers on the team and, together, they produce the high performing team where all success resides. As our Kevin Radford keep repeating, “We may not have it all together, but together we have it all”. It’s all about the team. So, let’s practice this together. I am not saying it’s natural or easy, but that, like everything else in life, it takes practice. It’s really no mystery; an exceptional high performance is a union of an exceptional personal performance with an exceptional capacity to work with others in a team. So, in the end, it’s really up to each and every one of us to make the choice and, on a daily basis, fortify our personal professionalism and practice working with others no matter what group they belong to. As we do that, we are building our organization and powering it on its way forward.